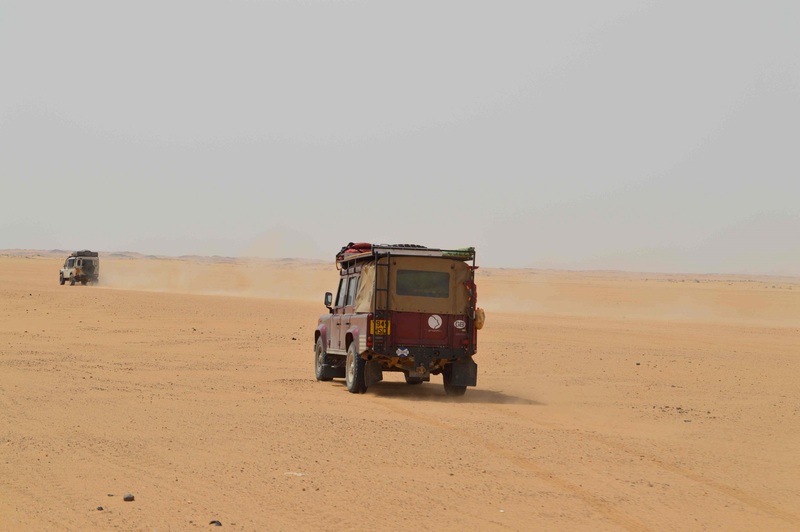 On the shores of Lake Nubia, where Egypt meets Northern Sudan and the Nile River sat a tired old Land Rover, having rolled all the way from Scotland. 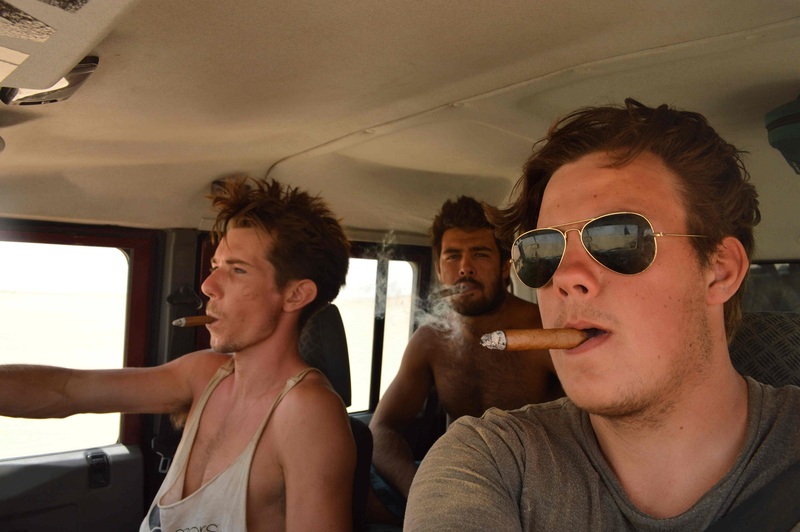 Three young travellers, modestly self-titled ‘The Gentlemen’s Adventure Club’ were ready to board a barge for the voyage south. It was in the same seats two years previous, winding down the country road from Edinburgh to the Scottish Borders on one of many commutes to woodlands where we ride motorcycles in the summer, that the dream of continuing down the road until we reached the bottom of the world became a real plan. After two years of thorough planning and wrapping up our studies, this same road became the first leg from Edinburgh to Cape Town. 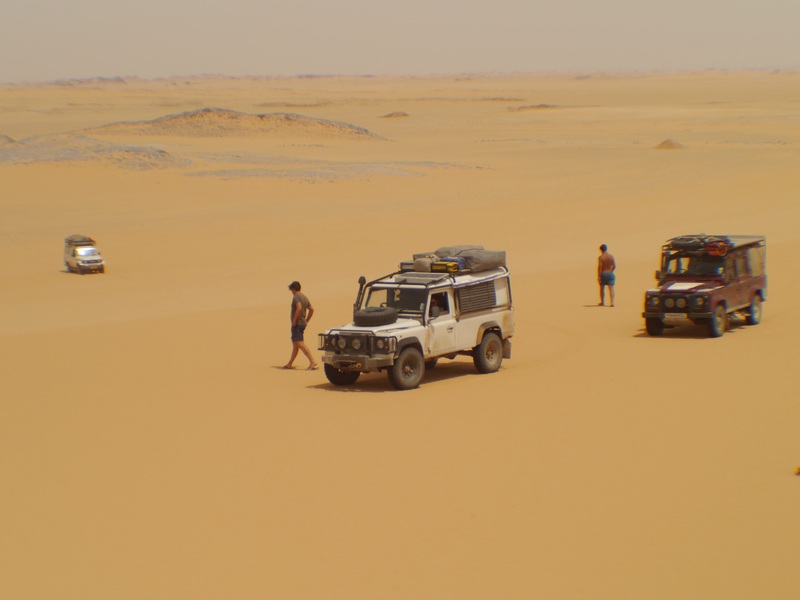 From the get-go, one of the most exciting prospects of this trip for us was to have a play in the world’s sandbox; the Sahara Desert. 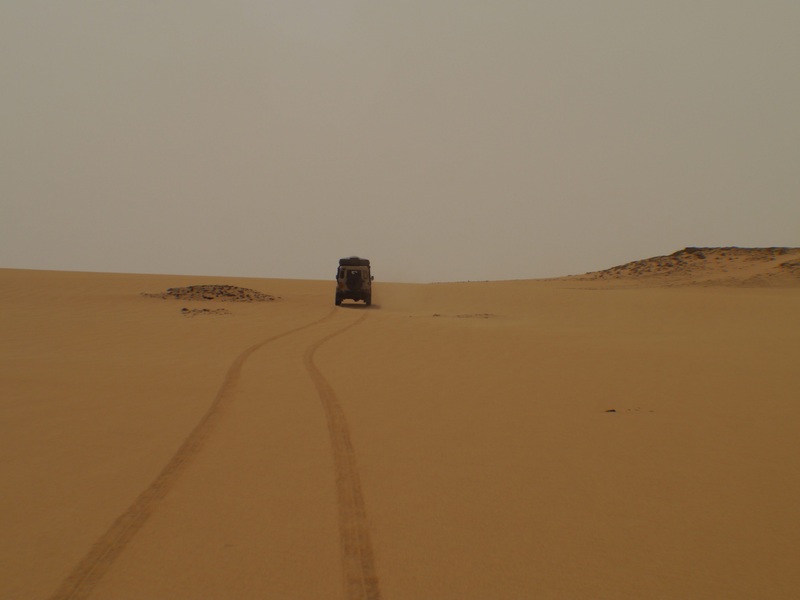 There are many launch pads in North Africa from which to explore, ours was to be in North Sudan. 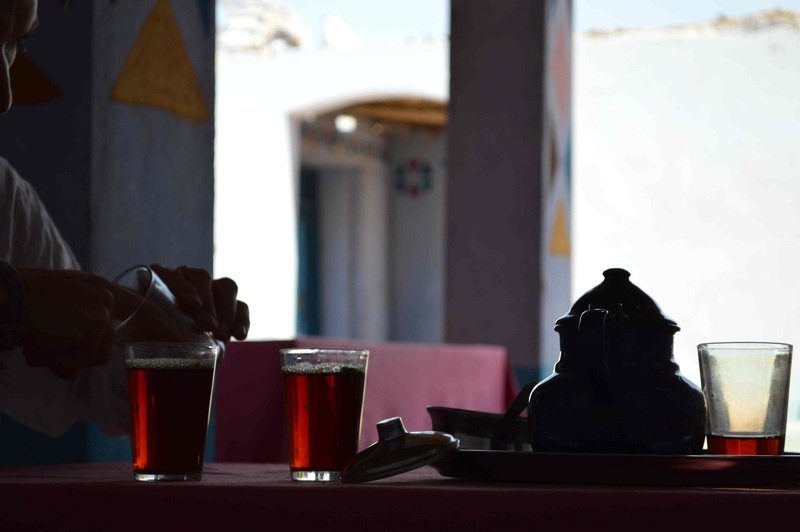 Most traffic cuts south and follows the well-trodden tarmac along the Nile, but if you want to get some sand in your teeth you can head east through the Nubian Desert. 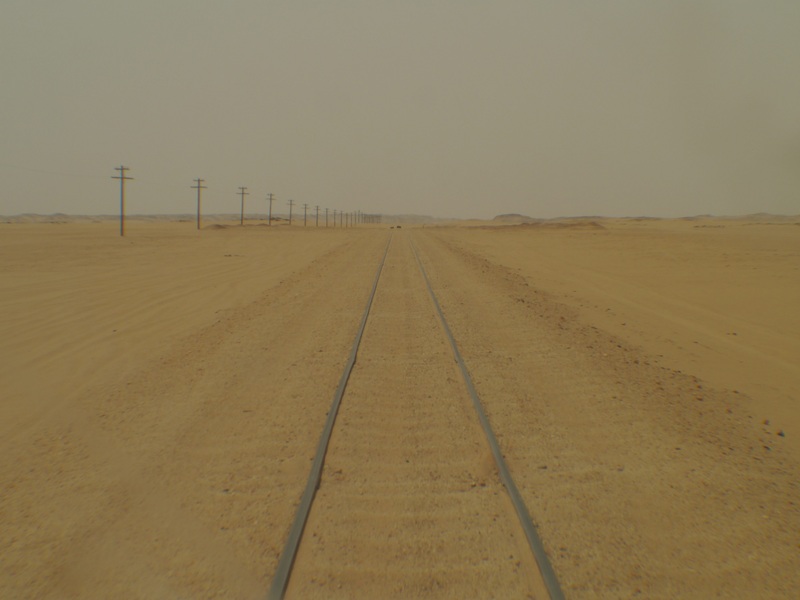 This is where things begin to get really interesting on a journey like ours; there is no road, or even a marked path of any kind, only an old railway track snaking a line through the vast emptiness from Wadi Halfa to Abu Hamed. On our arrival in Aswan in the south of Egypt we were met with sour news, although in the usual fashion we were left mostly in the dark. From what we understood, the motor on the barge was broken. The passenger ferry was still running but there was no way to bring vehicles down the Nile into Sudan. 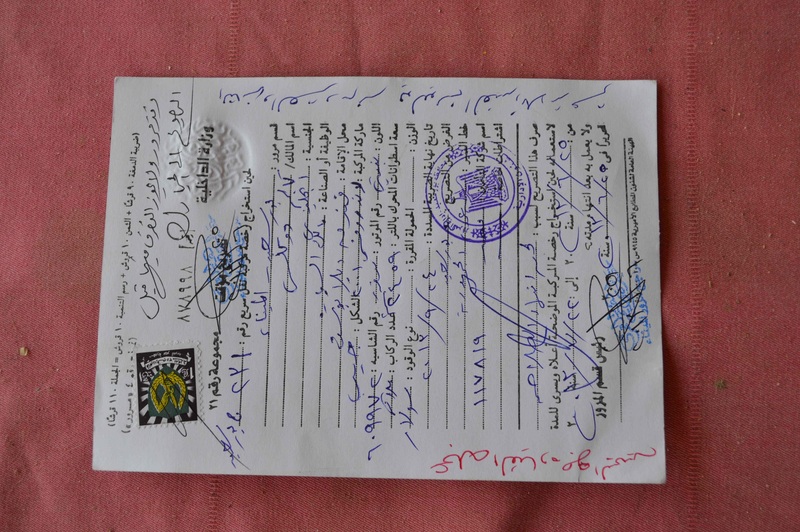 We hastily made arrangements to meet with a local fixer, a contact of our previous one in Port Said. 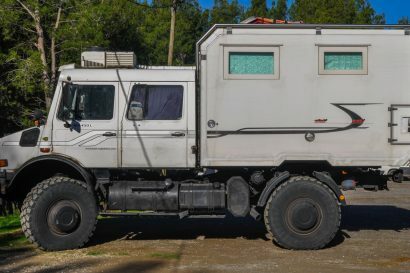 He connected us with the backlog of overlanders, a merry bunch all stuck in the same rut. 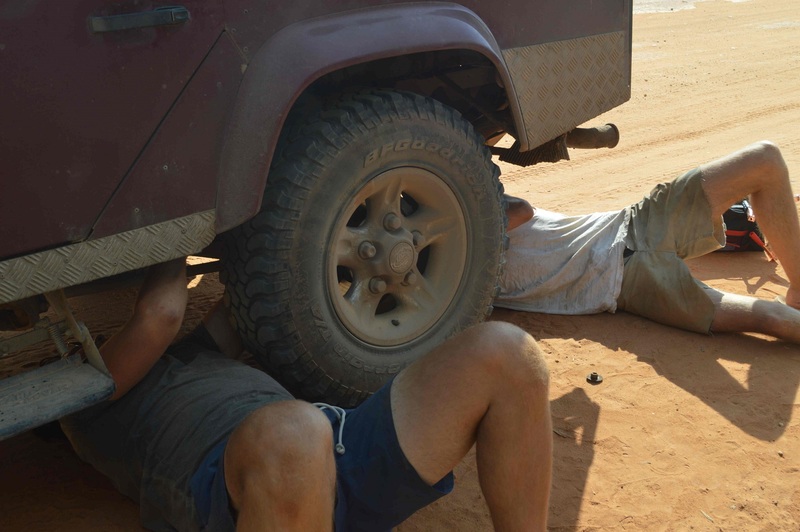 There was an English couple, naturally in a Land Rover with every accessory on offer bolted upon its frame. There were a couple of Irish lads whose Defender TDI was so baked it had the hood strapped on the roof to cool her down, and a mad and excited Dutchman in a classic 80’s Land Cruiser with an even madder Dutchman in a converted Mercedes Sprinter with a Vespa strapped to the rear and metal grates covering each window. 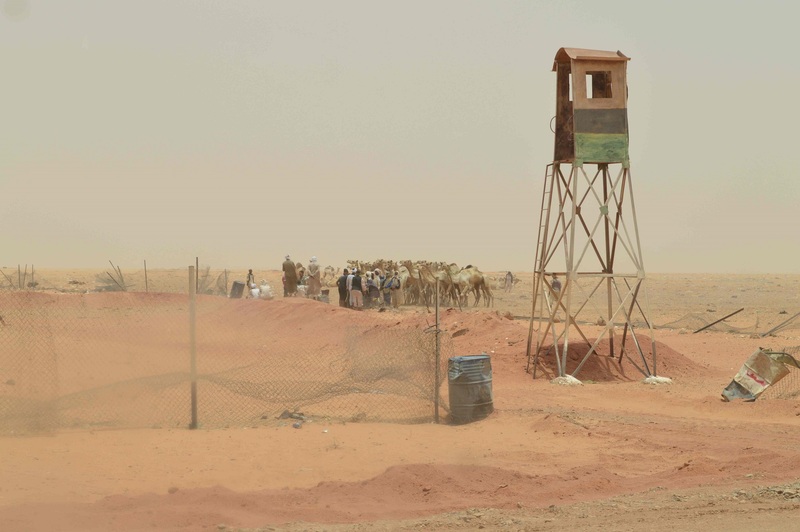 We banded together and arranged with the necessary parties to set up a land border crossing, the first of its kind between Egypt and Sudan to involve non-military or government personnel. Our first attempt to cross the border was unsuccessful. After a day waiting in the baking heat in the middle of a desert with nothing but a shabby hut and a wire fence separating us from Sudan, we were sent away, told only that the Sudanese hadn’t shown up. Typically the Egyptian customs agent who had come with us in convoy had already stamped our passports and removed our Arabic number plates, thus leaving us in a limbo between the two nations. By way of an apology they offered us each a can of cheap pop and a cigarette for our trouble. 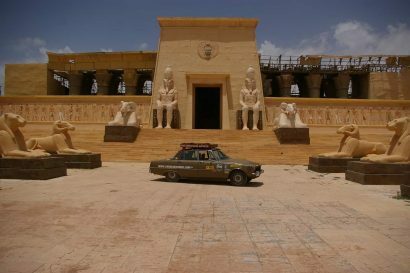 We were forced then to spend a week uninformed in a car park by the temple of Abu Simbel before we were given a second chance at crossing. 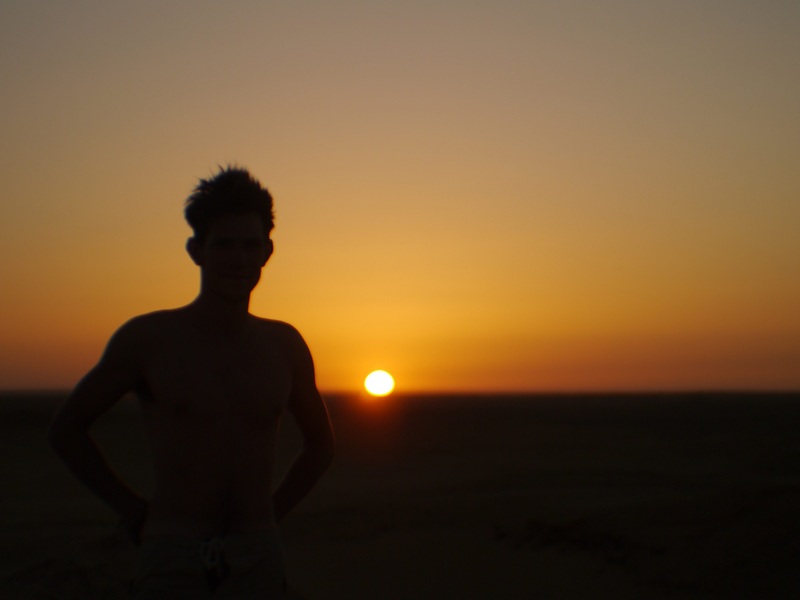 At the crack of dawn our convoy moved out of the gypsy-like camp and headed for the border. As a sign of things to come, a brand spanking new tarmac road had been laid in the week between our trips. We soon discovered that new blacktop was changing the landscape throughout Africa in shady natural resources deals between local governments and China. 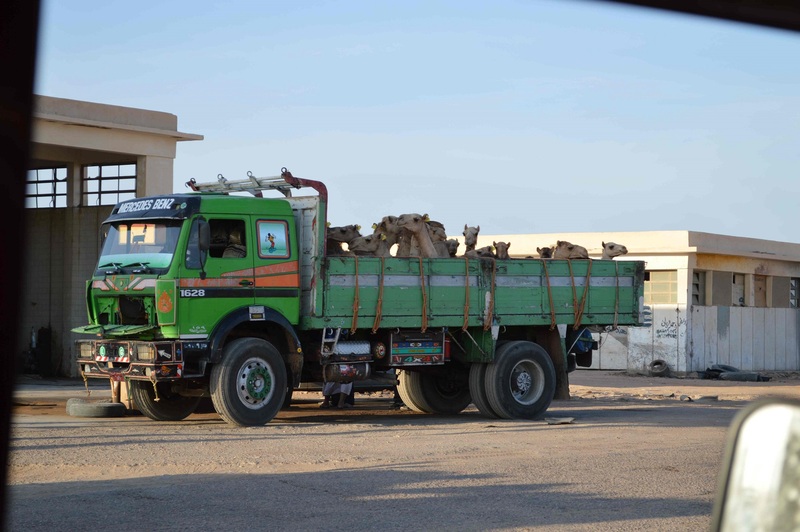 On arrival at the border we spotted around 200 camels on the Sudanese side, clearly waiting to be collected by Egyptian nomads. 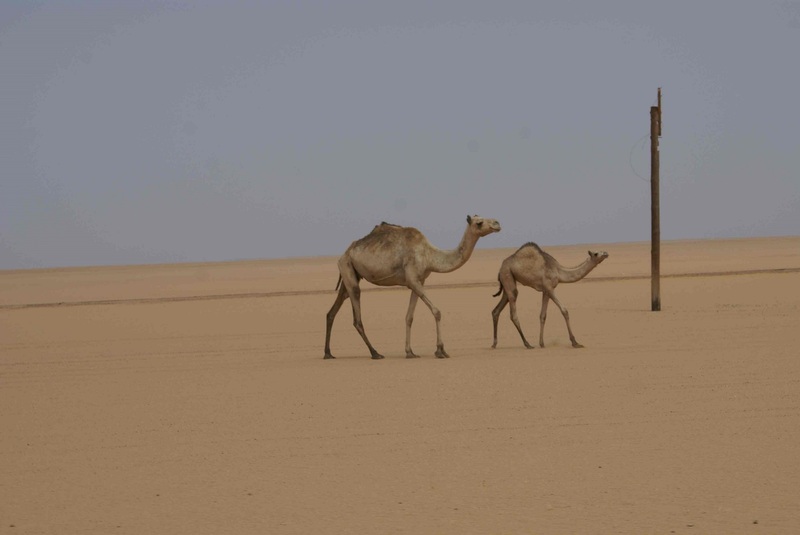 These desert people appeared from the horizon quietly and just as seamlessly they disappeared, camels in tow. It did cross our minds that we were being traded to Sudan for two hundred camels; a fair price one might argue. Once across, it was only an hour or so before a Sudanese official came to get us and requested we follow him to the banks of the Nile where we could board a military barge to Wadi Halfa. There, our vehicles were immediately impounded by customs for inspection and we were told we would be able to make tracks the following day. They also cleared up the mystery surrounding our delay, of course blaming it on their pesky northern neighbours. 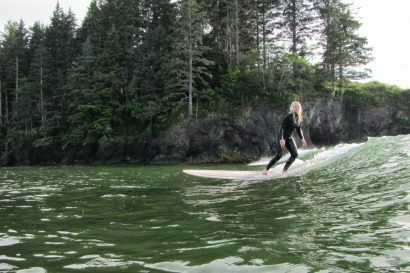 We spent the first (and only) night of the trip in a hotel – accustomed to the comforts of our plywood bed atop the Land Rover we had come to call ‘The Penthouse’. Morning could not have come soon enough as the three of us simmered in the close confines of our cell all night long. 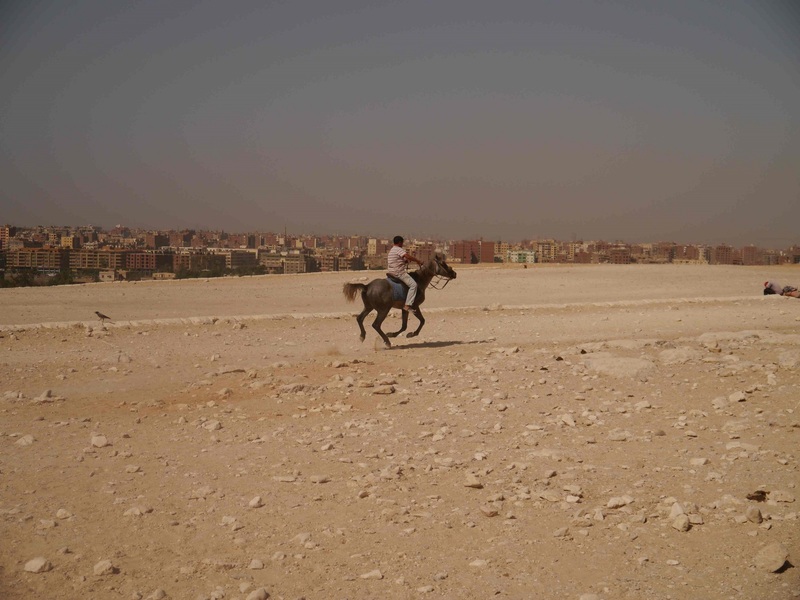 When it finally did arrive, we were pleased to find the Sudanese officials far exceeding the expectations set by their Egyptian counterparts and with some gentle negotiating, and reluctant wallet-lightening, we were through the gates and on our way. It’s never that simple though, and we were quickly stopped and made to pass the rest of the day at our fixer’s house waiting for the official who would provide our ‘Alien registration’ stamp. Clearly the man was not inclined to work on an empty stomach, it being Ramadan. To his credit, our fixer set the tone for our experience with the Sudanese people by generously inviting us to break the daily fast as the sun sets with traditional Ramadan super – of course we obliged and our group of nine sat in a circle that evening, sampling the delicacies that had been prepared by his wife, who was sadly not invited to join us and whom we never had the pleasure of meeting. Unwilling to waste any more precious time and itching to go, we rallied two other vehicles and their respective owners to accompany us and forgo the tarmac, hitting the desert for the next few days, following the railway line and seeing what kind of trouble we could get ourselves into. It’s a damn good thing that we did as Byron, the Englishman with all the gear that we neither had nor would have had the knowledge to use, was a valuable asset to our party and certainly proved to be a trusty companion time and time again. 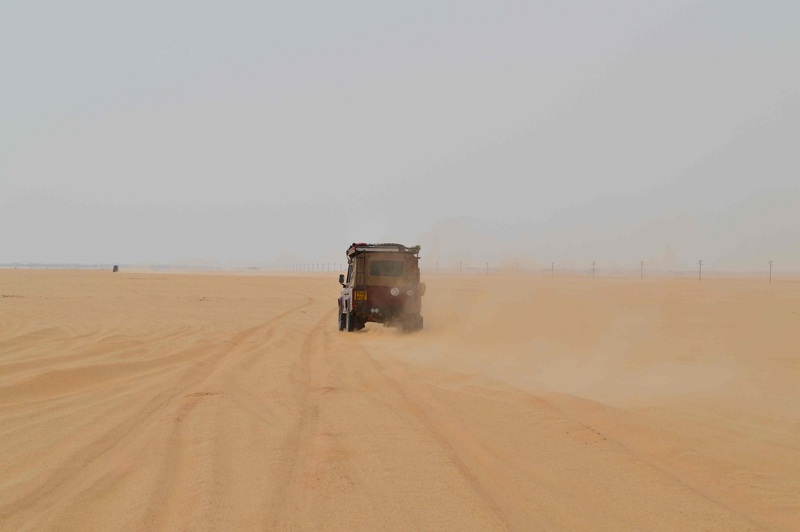 We fired through the little town and out onto the sand, straight past the snoozing checkpoint guard who, startled, could only blow his whistle at us as we disappeared in a cloud of dust. 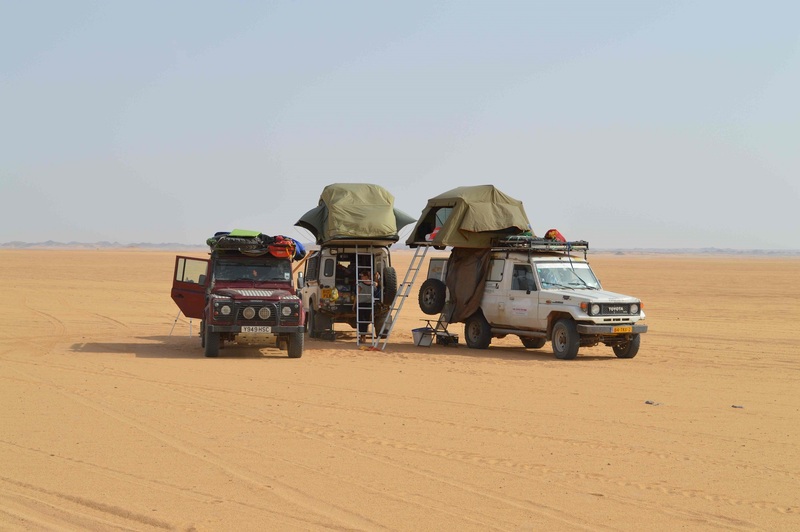 Tracks from trucks and other 4x4s littered the vast openness but no sign of life was present on the horizon and we quickly decided to set up camp. There’s nothing like the feeling of sleeping where you stop, no need to search for a hidden spot or a campsite. Of course, the openness would make it a pointless endeavour anyway so rolling to a gentle standstill and declaring camp is just as effective. 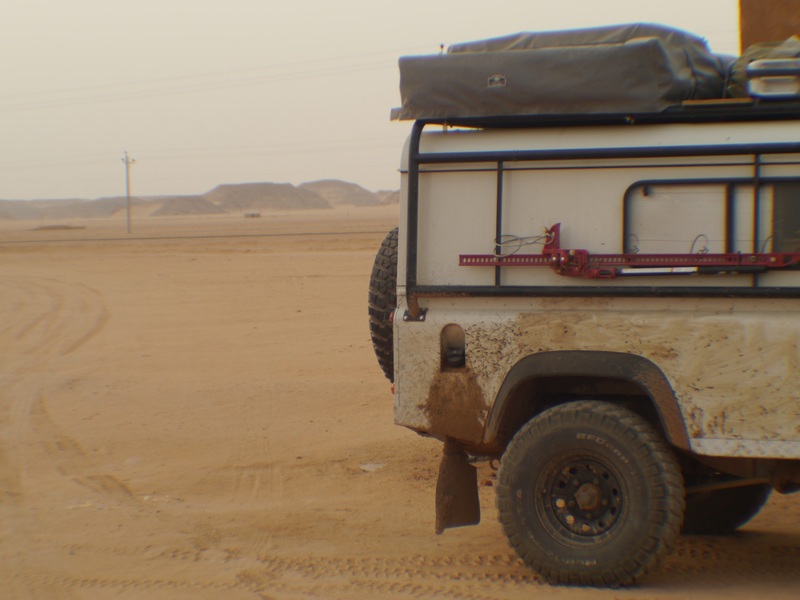 Back in the comfort of our sleeping bags resting on the roof of our wagon, we spoke of the wild journey Egypt had been and the long road ahead, what we would do should we be accosted by machine gun wielding bandits? The game plan is foggy now but I believe it involved a shovel. 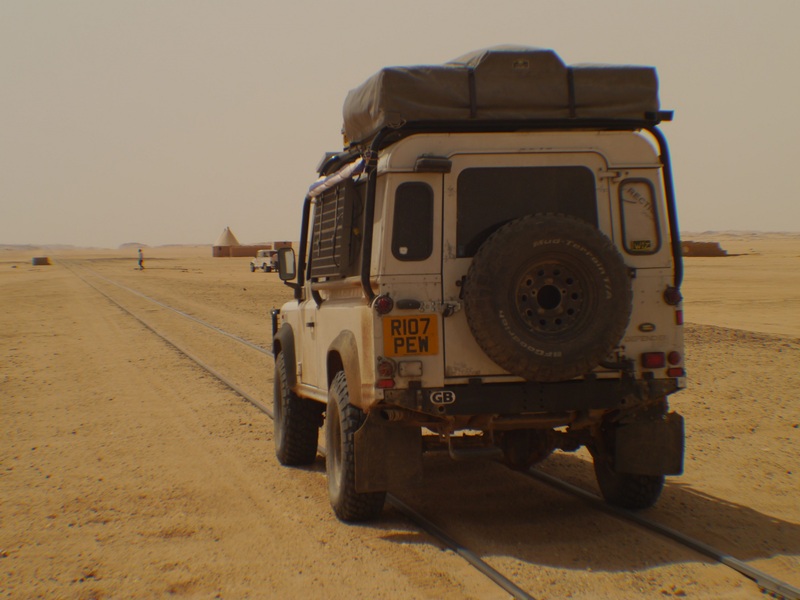 We would spend the next few days in the Sahara Desert, with one eye on the railroad and another on the terrain in front. 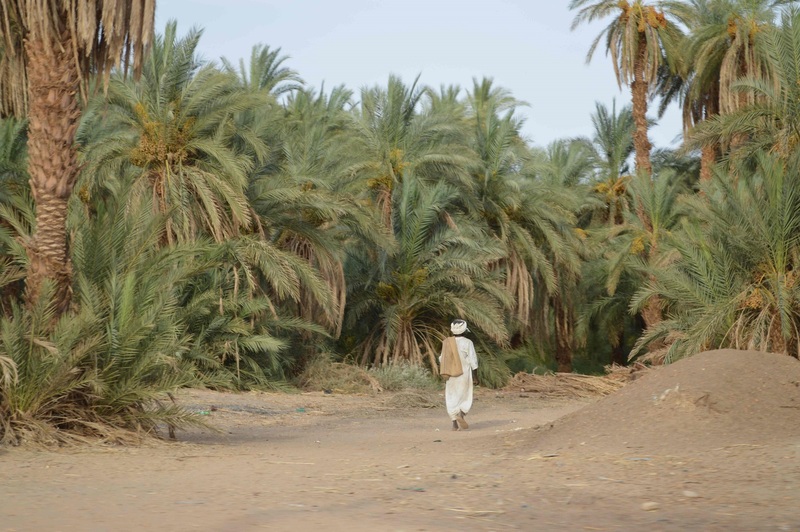 The following morning we re-boarded alongside the English and Dutch and continued on the desert treadmill. 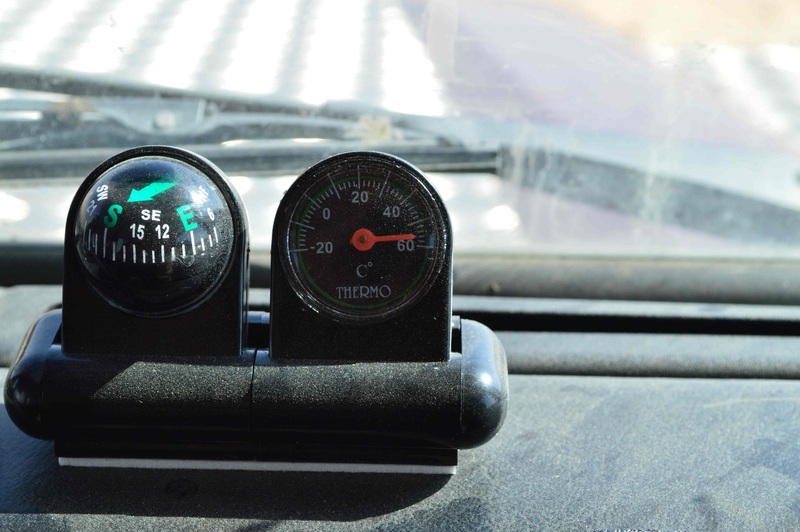 The driving was not technical or challenging as long as you could keep momentum going through the soft patches so as not to get bogged down, whilst not going so fast that you manage to inadvertently catch air off a sandy hump or the opposite, plummeting directly into a ditch at 50 mph. It didn’t take too long before we got carried away and endured a couple of hair raising moments, being shot off our seats or crashing to a stand still. 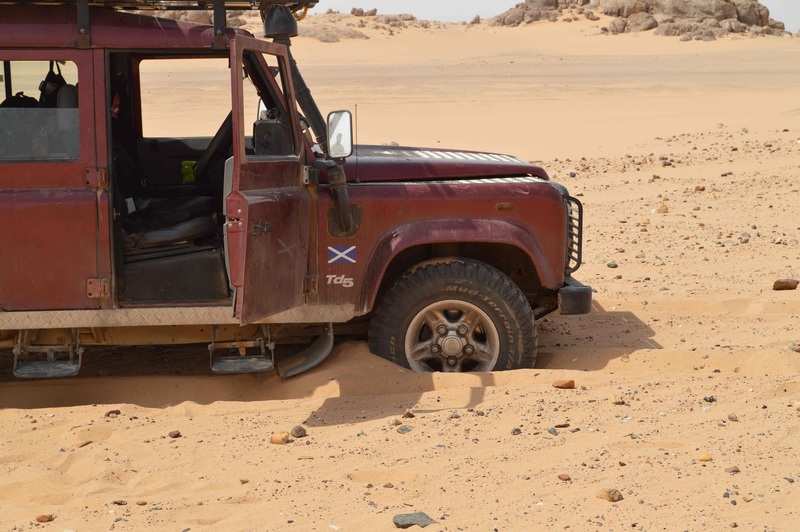 Land Rovers can take a great deal of punishment and we remain proud of the way ours held up through such adversity. 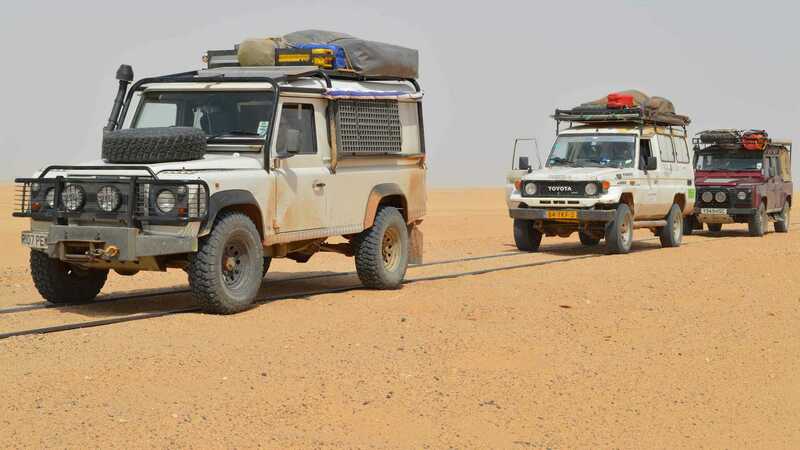 Continually we would have to stop for the Land Cruiser so that the hood could be popped and the engine pointed towards the wind for some breeze. The Land Rovers would sit there, idling smugly throughout the process each and every time. It is worth noting that, on a tight budget, we had hardly modified the Defender. Aside from practical solutions for storage and sleeping, we fitted underbody protection by way of diff guards and a skid plate but the suspension and everything else remained stock. As the afternoon passed and temperatures soared, we gained confidence in our abilities. We began taking larger deviations away from the railway line to gain scenic viewpoints and avoid patches of soft sand. The black, rocky patches became our friend and we often mounted the tracks, driving along the lines for great distances when it was the only solid surface available. 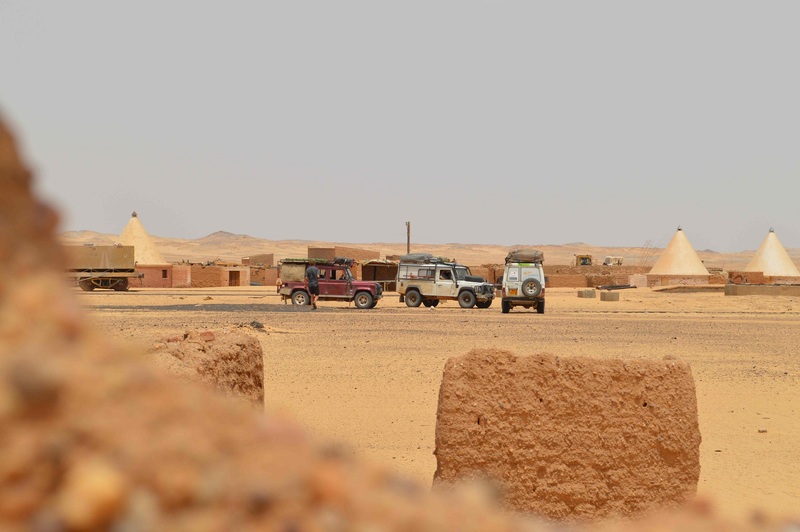 On occasion we would pass through small sandy settlements consisting of abandoned huts and sandstone buildings. We can only assume that these curious oddities were the homes of the poor individuals stranded here and tasked with clearing the tracks for the weekly train. There was not a living soul to be found in most of these little settlements, which proved a vital tool for navigation as we had a rough count of how many there should be between point A and B and so could judge our progress by checking them off as we passed. The railway line bore a strong resemblance to the American old west, with antique hand-cars and odd carriages littering the sand. Built in the 1890’s by the British to aid in military efforts against the Mahdiyah, who were fighting to end Egyptian rule in Sudan, it now serves simply as highway guidance for infrequent travellers. The reason for its creation follows the construction of the Suez Canal, Britain’s lifeline to India and the Far East, greater control was then sought for the Empire in North Africa. Britain constructed railways in her colonies as a means to transport troops and supplies efficiently over land. They would either persuade the local government to construct the routes or in the case of Sudan, advance slowly in the direction they are traveling, laying the rails as they go. Sadly though there was little care for the local economic or business needs and we were told the last train had been long ago, which reassured us we drove steadily along the rails. 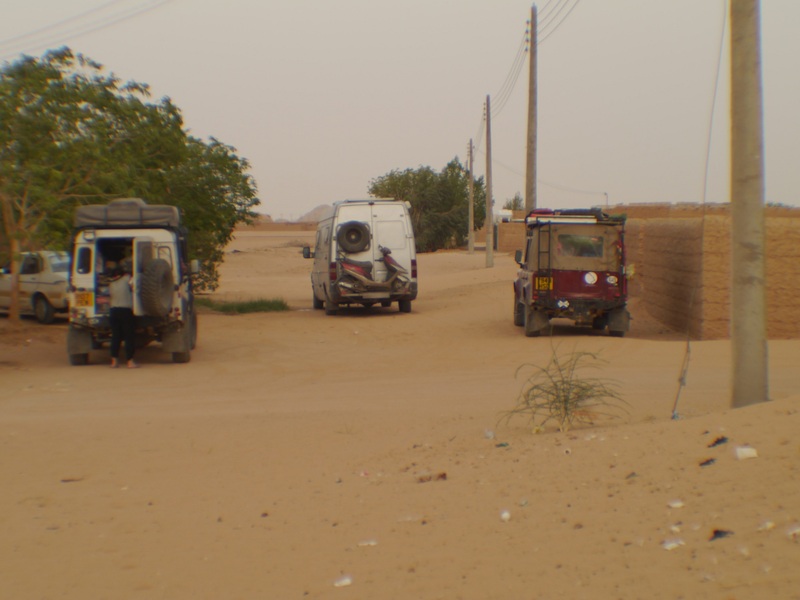 We made it to Abu Hamed at the end of the day, where we managed to find fuel and water. 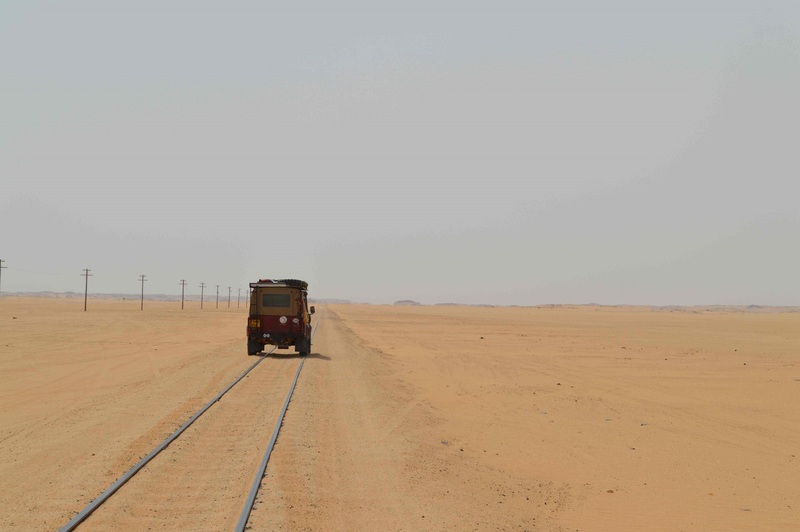 The railway line route through the desert remains the only way to travel onwards to Karima: our next port of call. Unfortunately, as we began looking forward to a second day on the sand, we noticed an ominous dripping from the undercarriage. Part two will be posted soon! For more information on The Gentleman’s Adventure Club, check out their website here.